Despite the superficial similarities—the graphics, the bonfire/altar save system, the rhythm of exploration and boss-fighting—Sekiro is fundamentally different to the Souls games in ways I wasn’t anticipating. The first couple of days I spent with it nearly prompted an existential crisis, in the same way as Tetris 99 did when I discovered that I was not nearly as good at Tetris as I’d always thought I was. Sekiro had me on the edge of despair, wondering whether the 10 years since Demon’s Souls had slowed my reaction times so much that I just can’t handle these games any more. I’m hardly an expert in the way that the Souls YouTubers and streamers are, with their soul-level-1 runs and terrifying PvP strategies. But I have been playing them for a third of my life, and Sekiro was kicking my arse. I’ve had to unlearn so many ingrained instincts that I think it would have been easier to come to Sekiro without ever having played another FromSoftware game. In some places it has more in common with older action games like Onimusha, Tenchu and Ninja Gaiden than it does with Bloodborne. Combat is aggressive and precise: playing defensively like you might in a Souls game will get you nowhere, as your enemy’s posture recovers whenever you back off, but trying to Bloodborne your way through with pure offense won’t get you far either. Here’s the thing about FromSoft games: despite their earned reputation for difficulty, there are always intentionally-designed ways to mitigate it. This is baked into the games in the form of the souls currency. Can’t do a boss? Go back to an area you’re comfortable with, grind a level or two until you’re stronger (or rethink your weapons and armor and try a different style of play). Extra levels and thick armor never help as much as familiarity with an enemy or sheer nerve, but they do help. 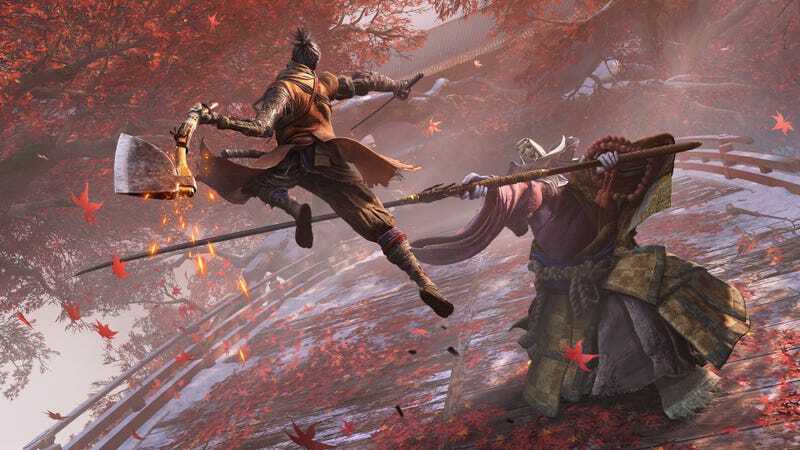 In Sekiro there is no leveling up: instead there are skill points, which might unlock a new maneuver or passive buff, but will not help you do more damage or take more hits. There are no different styles of play, like stripping off your armor and picking up a dagger to make yourself more nimble, or waving a wand around instead of an axe. You pick up your sword and grapple right at the beginning, and those are your tools throughout. This isn’t a criticism, but an observation. In this way Sekiro is philosophically different to the Souls games as well as mechanically. Since Demon’s Souls, online multiplayer has been part of the games’ DNA. They have always been communal efforts: gigantic puzzles that we, as players, had to solve together. Inside the game, players left messages and hints for others, their ghosts populating an otherwise dead and deserted world, and they could turn up in your game to help you through a tough spot or stab you in the back. Outside of the game, on wikis and forums and social media, lived a curious and wryly masochistic community sharing strategies, hunting down rare weapons and piecing together the lore. This has always been a crucial element in Souls’ appeal for me. After beating a roadblock boss like Ornstein and Smough or Bloodborne’s Vicar Amelia, I’d hang out around the same area for an hour or so and help other players through it too, enjoying the idea of making someone else’s day. You can make it through a Dark Souls game on skill alone (even without taking a hit, if you’re superhumanly talented), but a particular spell or buff item will often give you what you need to push you over the edge to victory, even if you stop short of summoning another player for a helping hand. In Sekiro, by contrast, you are very much the titular lone wolf. Skill is all there is. With the exception of the Shinobi Prosthetics, some of which are invaluable in certain boss fights, there’s no magic item or weapon hiding somewhere in the world that will make your life any easier. And there are no potential saviors waiting for your summon. I don’t think Sekiro would be improved by Souls-like multiplayer—it wouldn’t fit with the combat or the atmosphere—but that doesn’t mean I don’t miss it. Being all on your own, without so much as some cheerleading messages left on the ground, makes the challenge more real, but also more dispiriting. It took me a while to understand and accept this, and only then did I start to recognize what Sekiro was demanding from me. It wants focus, concentration, nerve, and courage. Stop dodging and trying to play defensively, and instead stand toe to toe with your enemy and deflect, deflect, deflect. Stop trying to create distance between you and your foes. Stop thinking that there’s something you’re not understanding about a given fight, some item or other piece of the puzzle that’s missing, and just head in there and get yourself killed until you can anticipate their movements and parry their every slash. And try to think like a shinobi: use the grapple to run away and hide when you’re overwhelmed. In terms of strategy, there’s much less to think about when you’re playing Sekiro. Most of the time, it’s just you and the sword. This makes it more focussed and, in my view, much less forgiving than its Souls predecessors. It also makes it more thrilling, if your nerves can take it.